Take a bowl. Add strawberry crush, 2 glasses of chilled water, salt, pepper, lemon juice, honey and whisk it well. Take 3 glasses. 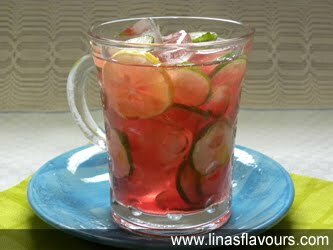 Add ice cubes, cucumber slices, lemon slices and pour strawberry juice. Note: You can prepare strawberry juice, cucumber and lemon slices in advance and keep it ready in different bowls in the refrigerator and serve it immediately to the guests.